This ADU process was informed by the notion of open-sourcing. 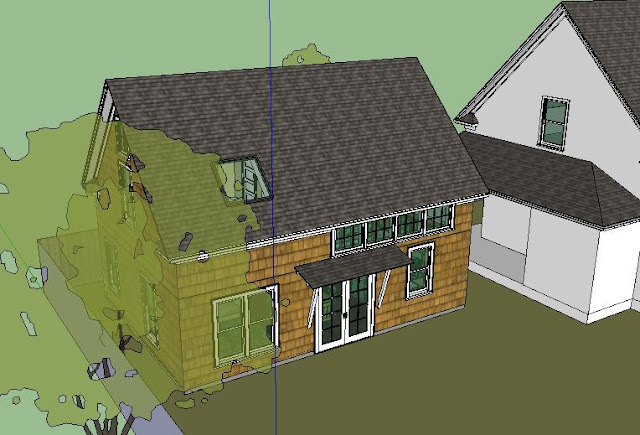 I found great ideas online, learned from others, built upon those ideas, and shared my experience so that others could build upon my experience as they (hopefully) pursue building their own ADU. In this vein, my architect and I are now sharing the ADU plans and the associated SketchUp model. This material is owned by the architect, but we hope it will serve as a useful reference for others. And, here is the ADU SketchUp Model. You can see fly-through animations that I put together before construction of the ADU from this SketchUp model. 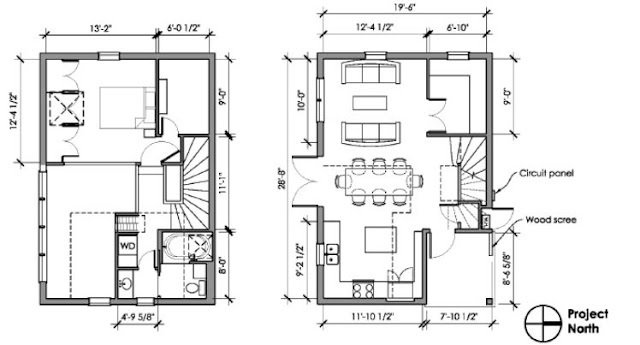 The ADU ended up looking very similar to the 3D model in real life, proving the model's value as a planning tool to envision how a space will look, function, and flow. Increasingly, architectural design will use 3D modeling tools. I've praised SketchUp in previous posts because it is free and relatively simple to use. 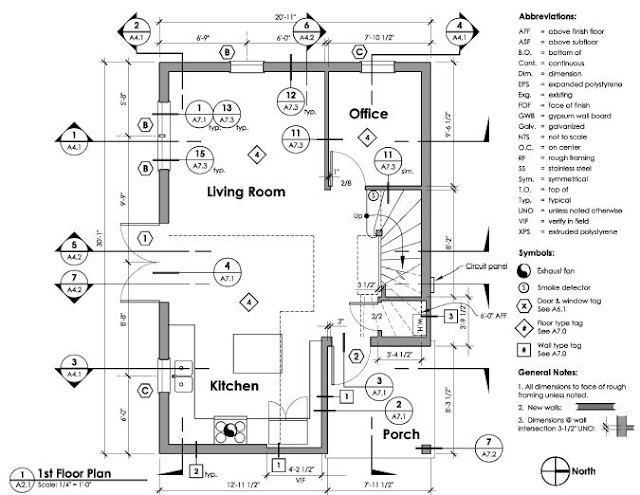 My architect drafted fifteen schematic design phases with me before we finally settled on this final plan. That back and forth process took a couple months. I was a picky client with lofty ideas. He was a talented perfectionist who appreciated the challenge of designing so much function in a relatively small space and riffing off of my energy design goals and particular design criterion. The result of this drawn-out design process paid off. The space-efficient design makes the ADU highly functional, and the lofted nature of the 1st floor ceilings and cathedral ceilings throughout, make it feel very large. The ceilings are 9ft in the living room, and over 20ft in the grand room. The kitchen, dining area, and living space, are visually separated by the ceiling and paint colors, but most areas of the house have 25ft views. This photo is taken from the dining area on the 1st floor, looking up past the 2nd floor catwalk, to the towering cathedral ceiling and hidden attic space along the east side of the ADU. The south facing window bank gives a nice vantage of tree canopies on neighboring properties, creating an illusion of grandeur. The full light french doors open the space into the sizable back yard. Yes, even on a standard sized 50 x 100 lot (the standard sized lot in much of Portland), it's certainly possible to have a large house, a full-sized 800 sq ft ADU, and still have ample garden/landscaping space. The ADU is 21ft wide and pushed up against the 5ft setback requirement for new buildings in Portland. This still left half of backyard for us to use for fire patio, an outdoor patio table set, a grassy area, plants, a covered awning with a chair swing, and more. The deciduous canopy on the south side of the ADU was a major part of the design consideration. Every ADU is different from the next. Since most ADUs currently are built by the current homeowners; they are custom-tailored to the homeowner's desired use. ADUs are often accented with custom craftsmanship that adds further textured interest to the small space. This level of detail results in quaint, intimate, and beautiful, customized structures. Beautiful structures will be cherished, and will be tended to by their owners over time. Unlike much conventional spec-housing stock, beautifully designed ADUs, executed under the watch of astute and financially-vested homeowners, are likely to last for generations, ultimately resulting in less residential construction landfill waste and less wasted energy. Wow, what a cool building! A very impressive ADU design. So many brilliant ideas to borrow - and how incredibly generous of you and your architect to share the permit plan set! I suppose the structural sheets, however, are not shareable? Fair enough. I have an idea of adapting a few things from your concept to a 1000-1200 sq/ft house that we are hoping to build in rural Oregon next year, and I would be very interested to pick your brain on one or two things at some point, if you happen to read this. Anyway, thanks for putting up this page, what a great resource! Hi Kurt. Glad you are able to take advantage of the plans. I'd recommend that you contact the architect who developed the plans. He can probably give you some ideas of whether and how these plans could work for you.